They feel like treats without being too sweet! Take one look at a posed Pinterest board, and you'll think you need to kill it at the school lunch game — and send your kids off with creations worthy of social media snaps. But that can be a tall and exhausting order for busy parents. So all the healthy snacks popping up in grocery stores are game changers. 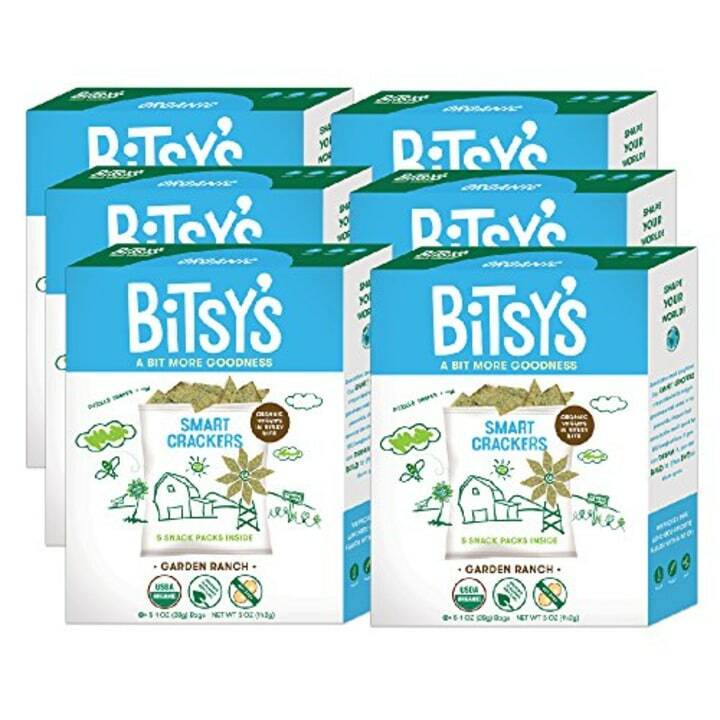 Not only do prepackaged goods simplify your life, but there's even a slew of healthy kids' snacks you can buy online, making it even easier to put together the best snack selection ever. That said, there are tons to choose from and everything looks “healthy,” according to the package. So you should do a little sleuthing of the nutrition-facts label and ingredients list. “Look at sugar first. Thanks to new nutrition labels, many products will list the amount of ‘added sugar’ in the product,” registered dietitian Lindsay Livingston of The Lean Green Bean said. (She’s a mom of three!) If it lists only “total sugar,” then read the ingredients list to see where sugar lands. The closer it is to the top of the list, the more of the sweet stuff it contains, she added. You can also see where the sugar is coming from. For instance, dates are often added as sweeteners, Livingston points out. Finally, we all know kids can snack all day long. 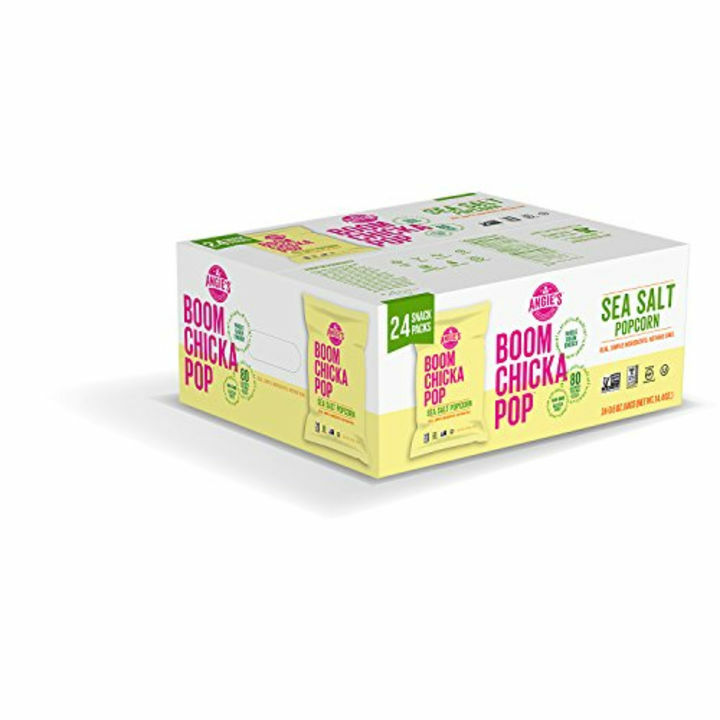 So along with simple ingredients, the best snacks “include at least a few grams of protein and fiber to give them some staying power,” Livingston said. These can be added to round out your fresh lunch fare. Need ideas? Single-serve containers of hummus or guacamole, plus dippers like mini peppers, rainbow baby carrots or seedless baby cucumbers are nutrient-packed options Livingston approves of. We asked Livingston for some of the brands she recommends and added one of our favorite picks, too. Here’s what made the cut. 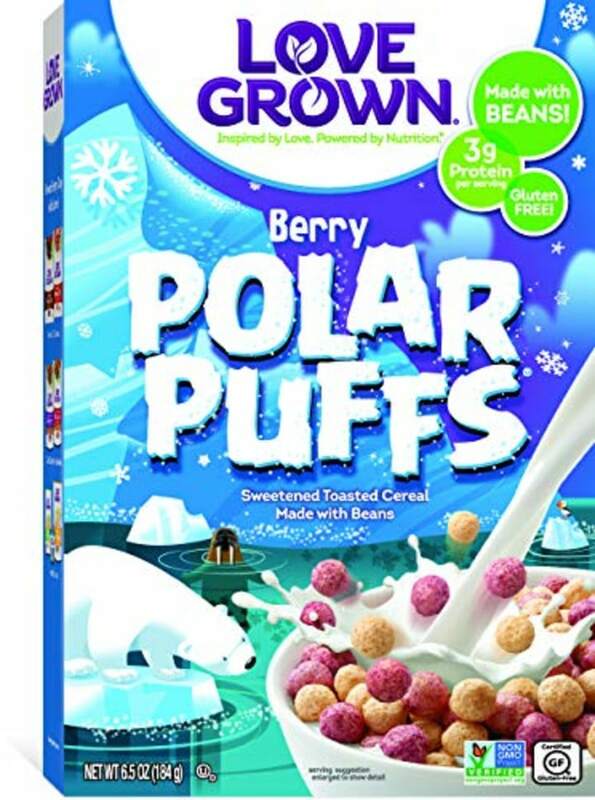 Because it’s made with navy, lentil and garbanzo beans (yes, really), this puff cereal contains 3 grams of protein and 2 grams of fiber per cup serving. The blueberry vanilla flavor is especially tasty. 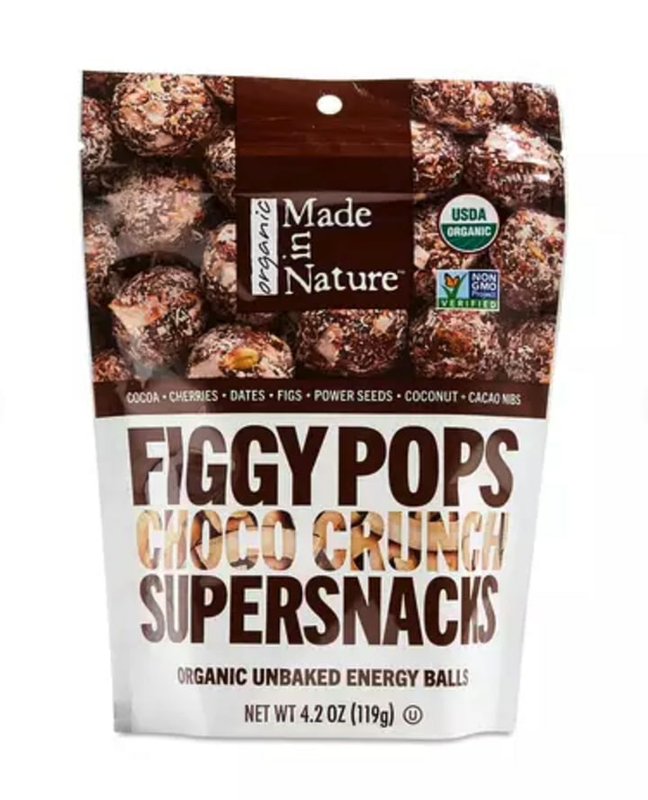 These bite-sized energy balls are made from dates, pepitas, figs and tart cherries, plus a delicious mix of coconut, cocoa and cinnamon. 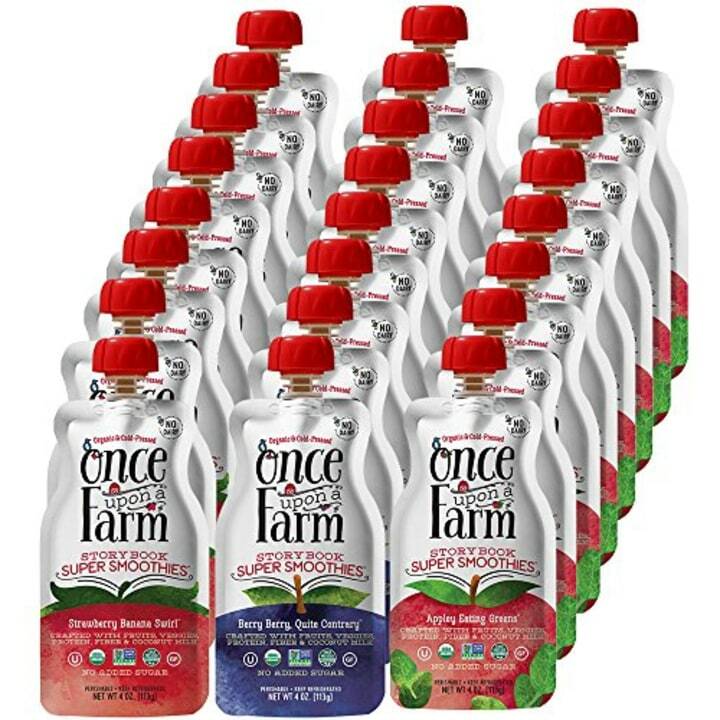 Two offer 3 grams each of fiber and protein. These crackers come shaped as parallelograms and rhombuses. Even better: The wheat crackers are fortified with vitamins and minerals. They supply one quarter of the vitamin D kids need per day, are a good source of iron and contain 2 grams of protein. 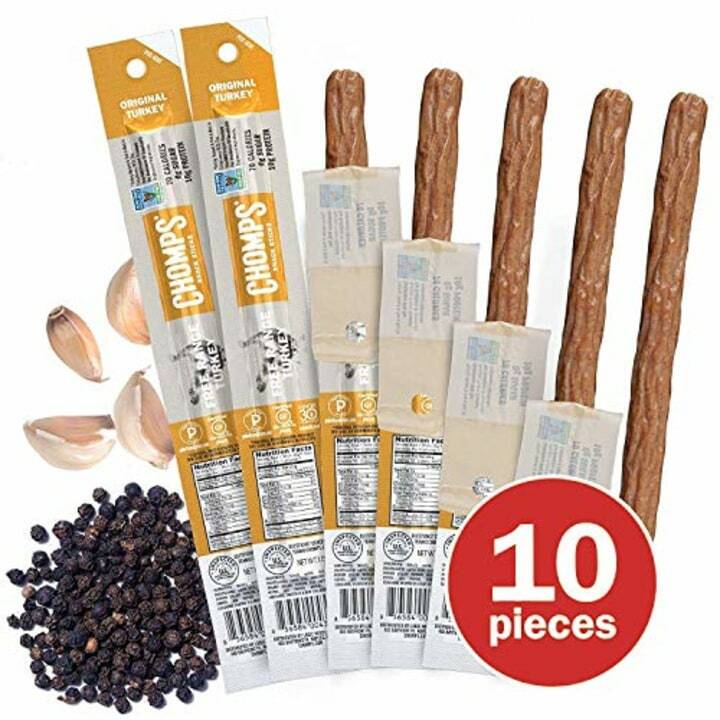 These sticks are made with free-range turkey, and they’re a good way to sneak in 5 grams of protein. Livingston said that these make a good pairing to balance out dried fruit or fruit strips. 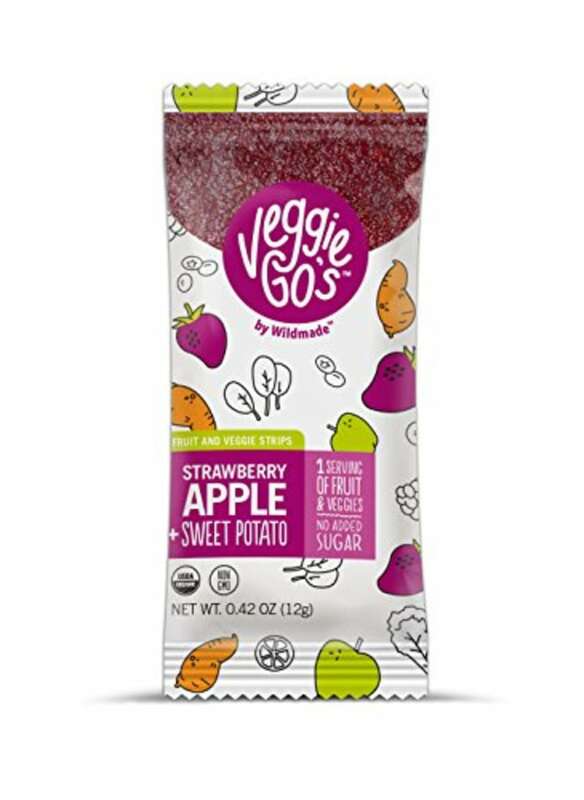 Made with apple, strawberry and sweet potato puree (with no added sugar), these offer one serving of fruits and veggies. Did you know that popcorn is a whole grain? One bag of Angie’s corn even has 2 grams each of fiber and protein. This light, tasty treat is truly craveable. How else are you going to get kids to eat chia seeds? These bars with just 6 grams of sugar are packed with whole oats and sweetened with dates. 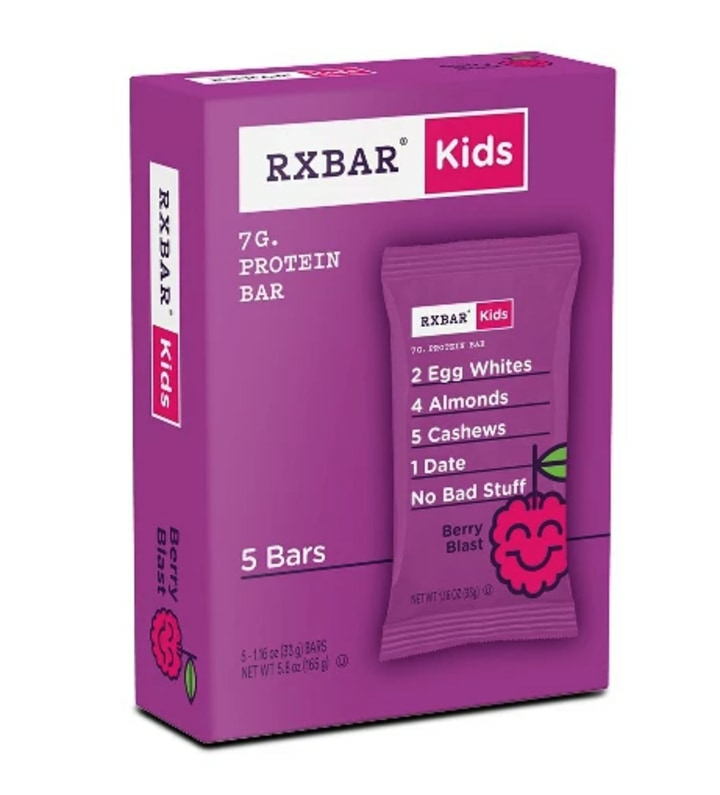 Ideal for the kid who loves a bar with a softer texture. Scrutinizing labels is tough if your kid has food allergies. 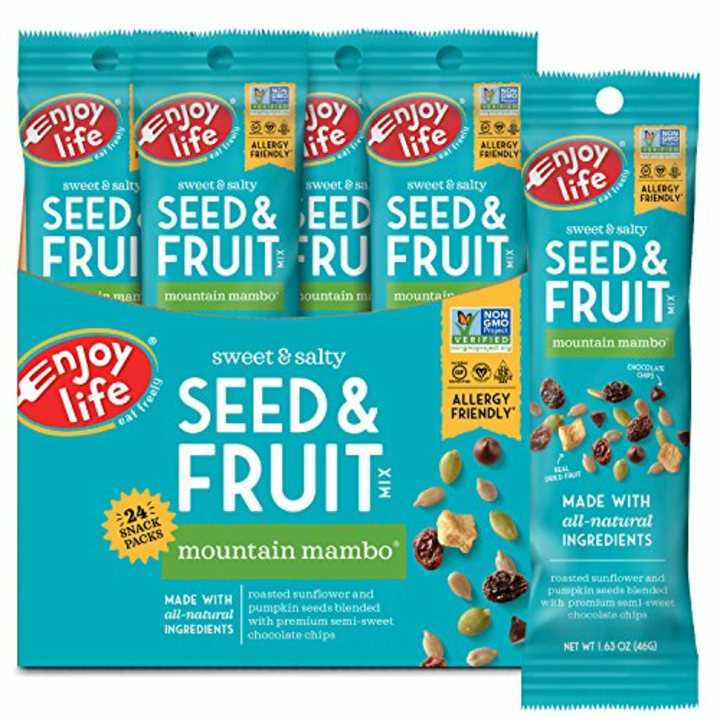 Enjoy Life is one brand that steers clear of the major allergens. This mix contains sunflower kernels, pumpkin seeds, raisins, dried cranberries, apples and a few chocolate chips ... for fun. 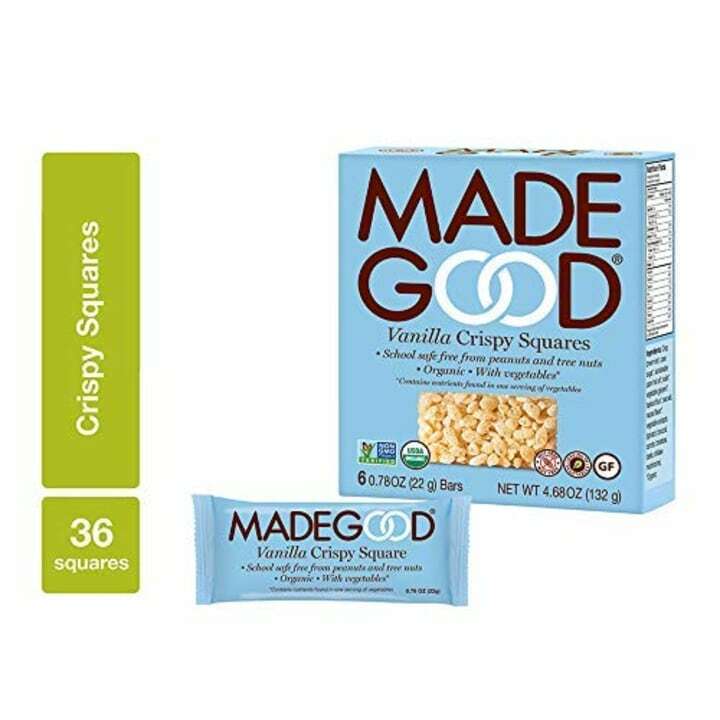 When kids need a treat but not too much of a treat (if you know what I mean), these crispy squares have 7 grams of sugar but are also pumped up with veggie extracts, making them a good source of vitamins A, C, D and E. The brand is also school safe and free of the eight major allergens. These are an obsession in my house. Obsession. Made with fruits, coconut milk, seeds (flax, chia, pumpkin), quinoa and sweet potato, they’re free of added sugar and offer 2 to 3 grams each of fiber and protein. The packs can hang out of the refrigerator for four hours, making them great for a midmorning snack. 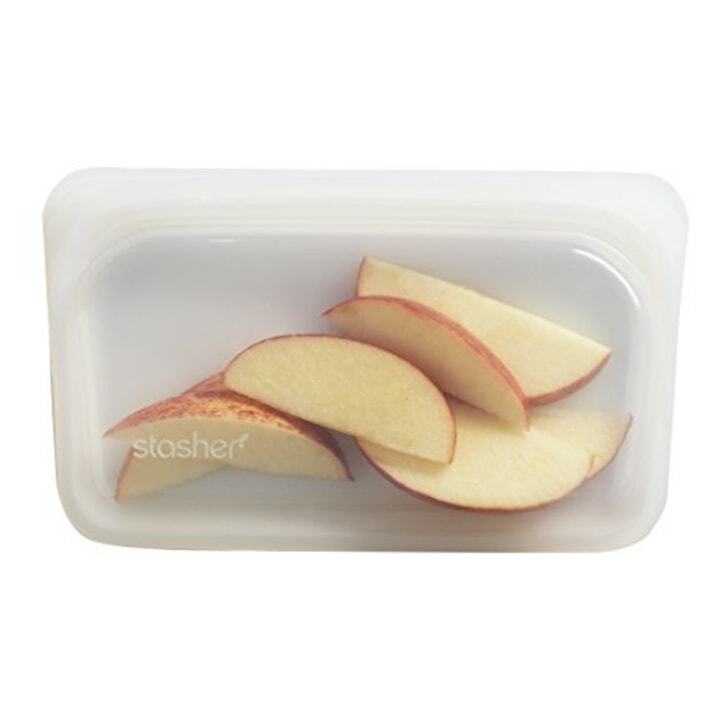 If you're packing your own snacks like veggies or fruits, rather than going through a ton of single-use plastic baggies, pick up a few silicone food bags. They keep the contents better protected, compared to a typical baggie. Plus, you can pop them in the dishwasher to clean. Of course, you must rely on your kid to bring them back home, so you might want an extra — just in case. We use these in my house.